The radiology or diagnostic imaging service is an important clinical support service is usually provided by the Radiology department. However currently, the use of imaging devices are ubiquitous within all clinical areas. The Radiology Information System and Picture Archiving & Communications System (RIS-PACS) facilitates patient care by enabling radiographers (radiology technicians) and radiologists or any person performing imaging procedures to carry out their work and report on the findings. Integration with the Clinical Information System allows clinicians to view images and reports made on them. A good RIS-PACS system should enable clinical departments or units to use it to perform imaging procedures and acquire images for their own use or use by others. For example, echocardiography is used extensively in the cardiology unit. Obstetricans and gynaecologists use ultrasound as an aid to determine diagnosis and dtermining progress. Endoscopists uses ultrasound and x-rays as an adjunct to endoscopy both for diagnostics and therapeutics. Surgeons may also use ultrasound as an aid to locate lesions in large organs. Hence, the provision of the RIS-PACS application should not be confined to the Radiology Department alone. 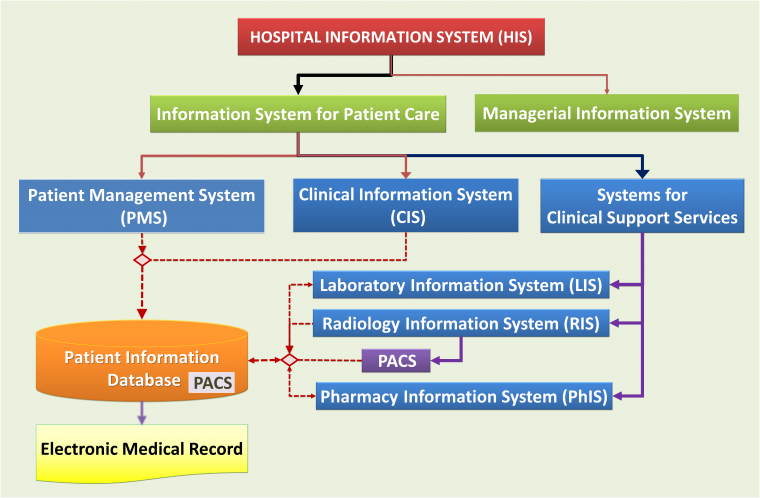 In a fully integrated Healthcare Information System, RIS-PACS is integrated with the Clinical Information System (CIS) and the Patient Management System (PMS). Radiology images and radiology reports are considered as patient data which is incorporated into the CIS and EMR. Traditionally, RIS provides the means for the acceptance of orders, creation of work lists, tracking of the work process. It also enables the documentation description and interpretation of findings (in radiology circles said to be reports). The Picture Archiving and Communications System (PACS) is an application used to manage image data. The Picture Archiving function is used for storage of images in a database. The term ‘archive’ here is used in place of storage. The Communications portion, is the application facilitates the transfer and retrieval of the images. Images and reports RIS-PACS and should then be considered as part of the Patient Information Database. PACS are often considered as separate from RIS because, traditionally, it is often provided by manufacturers of radiology machines/devices while RIS is provided by CIS vendors. However, currently many vendors provide RIS-PACS as an integrated solution which can be interfaced with machines/devices from ant manufacturer for example with RIS and PACS originating from the same vendor or RISPACS supplied as a combined solution. What differentiates images from other data is their large volume and the format by which it is stored; thereby requiring a network, server and storage hardware that have enough band-width, processing power and storage capacity to cater to this need. In this sense PACS is a sub-set of RIS. However, it may be developed/procured separately as long as there is a high degree of integration between RIS and PACS, such that functions can be carried out seamlessly across the two applications. All identification and demographic data for use in RIS-PACS are derived from the Patient Management System (PMS). Further on, integration of Order-Entry Result Reporting system (or CPOE) with RIS allows for orders to be listed and scheduled. Based on scheduled orders, work-lists (task lists) are created in PACS (through HL7) for radiographers/radiologists and machines (DICOM worklist). Conversely, there is a facility to display the performance completion status of orders and tasks (e.g started, in progress, completed and reported) in CIS. An image or a series of images usually have a report attached. Radiology reports should be considered as clinical documents preferably written as structured text in RIS. Thereafter, there is a facility to display them in CIS and incorporate them in the EMR. At the same time, a URL in CIS should link reports with a viewing application so that images (residing in PACS) are associated with the reports. To achieve the above objectives RIS and PACS need to be closely integrated. However, it is necessary to differentiate the functions of RIS as opposed to PACS. In a fully integrated system, the requests or orders for radiology examinations are made in the Order Entry (CPOE) application of CIS. It should also be possible to view the status of the progress of the administrative processes, the imaging processes and the radiologist’s reports in CIS. For clinicians to retrieve and view images however, it is sufficient to provide a link to PACS application via a URL (icon). The description here refers to the instance when RIS is designed to be part of the Information System for Patient Care. Alternatives are discussed briefly. Requests/Orders would be made by clinicians in the Order Management System (CPOE). Orders should be made even when the imaging process is performed by clinicians e.g. imaging of the abdomen in ante-natal care or when performing Endoscopic retrograde cholangiography & Pancreatography (ERCP). It is not acceptable for imaging orders to be made in RIS-PACS via a separate URL/icon. When imaging orders are part of a order set made up of other types of orders, the imaging orders are routed to RIS. A panel of or set of imaging studies can be ordered simultaneously. The timing of their performance are planned using the scheduling application in RIS. Like other orders, there are means to provide details or comments and to include instructions (e.g. requisite biochemical a tests to be performed, their results, and patient preparation), and guides (patient education material). The orders will also have charge codes attached for purposes of charging and billing. Orders accumulates in a general list as and when the orders are received. Sub-lists are then created based on order types based on which cases will be scheduled. Staff at the reception counter of the Radiology Department/Unit views and vets requests/orders made. This arrangement ensures smooth flow of data from CIS (orders) to RIS. For the clinician, the work procedure and screen view (GUI) of the applications would be similar to that used for other services. Integration with RIS, dispenses with the need for Radiology personnel to perform any conversion or transcribe data that has already captured at the time of patient registration and ordering. The transfer of data occurs through HL-7 compatible data output and input without the need for transcription. This arrangement gives a small advantage. If CIS is not functioning (because the system is down) or the interface fails, it is then possible to perform both Ordering and Scheduling of examinations within a functioning RIS. The Radiology Department staff can use the order and scheduling application within it without depending on CIS. If RIS and CIS are properly integrated, access can be provided to to the radiologists and radiographers to view sufficient relevant clinical information e.g. allergies, pregnancy / LMP, investigation results, diagnosis and other pertinent information. They should also use the CIS to perform clinical activities such as monitoring, drug administration, and document their findings (such as allergies and incidents). On the other hand, if they do not have access to CIS, the result is less satisfactory. In this situation clinicians need to provide the information by transcribing much of the clinical information in the order details/comments. The provision of these data by clinicians can be made mandatory based on the examination and patient type but this is tedious. Provision must then be made in RIS for radiologists and radiographers to record findings such as contrast or other drugs given, contrast reactions/allergies and incidents. These information need to be somehow transferred to CIS. The same imaging order are repeated only when there is an indication for it. This indication is related to the likelihood of development of changes within a given time period. For the sake of reducing radiation exposure and wastage, a good RIS will have mechanisms to detect repeat orders made within a predetermined period and to prevent the tasks from being carried out unless there are clear indications. The ordering system displays warnings when the examination ordered conflicts with existing orders for the same patient. To aid the user in selecting the correct examination a help option is available where details on Radiology protocols, examination, patient’s preparation and post examination care notes are provided. It shall be possible to print the details on demand if required. Clinicians are able to view and track the process performance status in the Order status view of the CIS. If clinicians are to schedule their own orders then it would be best that they do so using the scheduling application familiar to them i.e. provided in CIS. In practice, it is preferable for the unit providing the imaging service to have control in planning their work schedule, decide on priorities and optimize the use of resources. The task of scheduling should be given to one or more privileged users (receptionist, radiographer or radiologist). However, for routine examinations with ready resources (e.g. plain X-rays), a system where cases are slotted automatically when clinicians make a request is better. This may be on a first come first served basis or at the requested date and time. Manually going through books and pages looking for available slots. A color-coded diary view shows the availability of appointment slots over a selected period of a week or a month. The system prevents a user from scheduling a patient for two examinations, at the same period. However, it allows a set of sequential examinations to be performed within the same consultation (encounter). This will allow examinations using various modalities to be performed plus viewed together and interpreted by the same radiologist. The Scheduling application prevents duplicate appointments / double bookings within the same slot. To prevent redundant orders and wastage, a warning is displayed on attempting to schedule a repeat examination within a predefined time limit. In order to make the scheduling process quick and intuitive, prompts and options aid the user at all stages. Where there is more than one room/machine per modality, the application allows for the flexibility of re-distribution of cases i.e. assign a patient to an available room/machine list e.g. by dragging a case from the main list/sub-list and dropping into any empty slot of another list. enable users to define standard examination duration so that when an examination is scheduled it automatically books the correct time duration. Modification of the time and duration, can be done if the expected time is longer or shorter than the”standard”. the schedule is presented in a clear diary format where users can view appointments within different time frames on one screen. Booked appointments, available appointment time slots, blocked time slots and restricted slots would be colour coded and display details when selected (or hovered over). Cases are scheduled based on active orders. If an order is cancelled or postponed, this would prompt an alert for case to be re-scheduled. The Scheduling System allows for amendments (cancellation, change of date and time, change of resource etc.) to be made by staff provided with the privilege to do so. Amendments made shall be automatically updated in the scheduling book and the Order management of CIS. An audit trail of amendments made together with the reason for the amendment should be made available. Once a patient is scheduled, instructions and other information (advisory created by the hospital) are given to patients concerning appointment dates and preparations for examinations. It is useful if these documents contain pre-prepared graphics besides text but also allow for ad hoc addition of extra text when required. It should be possible for these documents to be e-mailed and printed automatically or on demand. Patients who have an active visit (already registered as outpatient, daycare or inpatient case) shall have their encounter acknowledged and considered to have checked in at the Radiology department). The visit registration of patients coming solely for Radiology examination is performed preferably in the Patient Management Application of the CIS either at the hospital’s main registration counter or at the Radiology department. Visit registration and visit/financial number are important for including the activity as part of the Patient care activity/EMR and for charging/billing. The patient would also have to be “checked-in”. Once orders are converted to tasks, the facilitation of work processes are taken over by PACS. The list of orders of a particular examination / machine / room / performer for a particular period of time can be glimpsed from the appointments page of the scheduling book. The orders remain as tentative tasks until the patient’s arrival is acknowledged and the patient is deemed suitable for undergoing the examination/study/procedure ordered. When the patient has checked in, the accession number for the planned examination is given marking the transformation of the order into a definitive task. The examination is then inserted into the task list or work list for the room / machine / performer as slotted in the scheduling book. Modification of sequence/priority can be made. The patient’s performance progress status of the entire procedure may be denoted as ‘listed’ both in RIS, PACS and in CIS. Creating this work list is a function RIS. The process is applicable for all patients undergoing examinations in the main Radiology Department or at any other point of care (units or departments) where imaging are performed. Depending on how cases are scheduled, RIS or PACS can create a (DICOM) work list for a set of machines of the same modality (e.g. plain x-ray, ultrasound etc.) 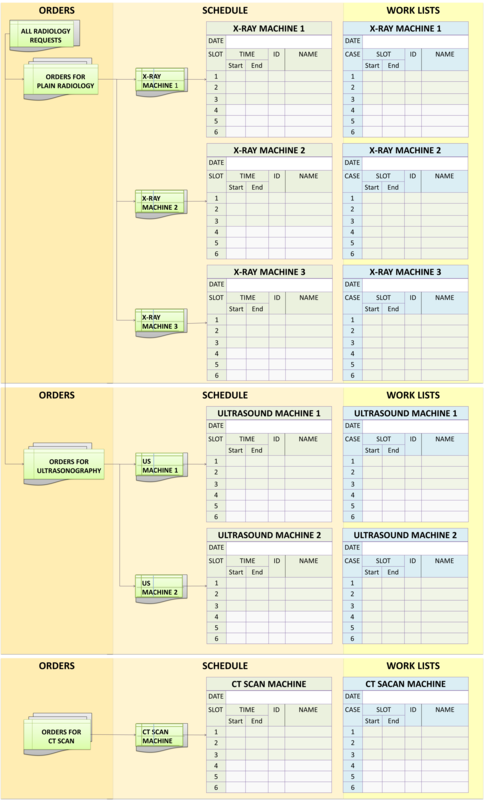 and sub-dividing the work list for each individual machine) or worker (radiographer). Otherwise lists can be made for individual machines straight away. The DICOM worklist will appear on the computer of each individual machine. Before an image is taken it is important to ensure that the correct order and therefore image is matched to the correct patient. The person performing the examination need to view the the patient’s ID (name, MRN) on the DICOM work list on the computer system of the machine. He/she (Radiographer, Radiologists or other Operators) calls the patient based on this list and confirms the identify patients and match the examination by asking the patient or looking at the particulars on the wrist-band. He or she can select the patient from the list using a bar code scanner and begin the procedure. When cassettes and readers are used, the RIS and PACS should transfer the same identification data onto the cassettes and cassette readers. The system shall allow labels to be printed on demand with user-defined identification and examination information. These would be used for assigning individual cassettes to patients when necessary. Images are captured by machines using the technological modality peculiar to the machine. This usually be initiated by pressing start on the machine computer or manually using a switch. The images can be single or multiple still images or when fluoroscopy is used, a series of video images. Imaging equipment need to have a DICOM interface to enable transfer of orders and resultant images from PACS system to them. If it is not already built-in, the interface need to be built. It is important therefore to evaluate machines to determine DICOM compatibility and the necessary procedures to achieve proper interfacing of machine to system. DICOM codes are constantly upgraded and compatibility of machines depends on their date/year of manufacture. Once performed the image is retained (usually temporarily) in the machines own storage system. The PACS System acquires them and sends them to the PACS database, assign them to the right patient folder and stored permanently. Nearly all machines of various modalities export captured image data in the DICOM format. Once and order is confirmed and the task is initiated, a file for images is created in PACS database for the patient. The images being sent will have the identifying data set . These data and that in the destination file need to match. Subsequently, descriptive information regarding the image accompanies it. Raw images shall be retained for a temporary period in PACS as defined by the organization. In general radiology, mobile radiography and some other machines, a cassette is used to capture the image. This is read and converted to digital data using Cassette Readers which exports the data in DICOM format. The work list for the Radiographer appears as task lists on the workstation computer. The work list for machines shall appear as task lists on the computer of the machine provided by the manufacturer. It is usually in DICOM format. Image capture refers to the creation and transfer of images of parts of a patient’s body by machines (situated at resources) through the use various modalities (X-ray, Ultrasound, MRI etc.). Even though RIS-PACS systems are designed to acquire data that is already in digital form when exported from machines, for the purposes of this project the Contractor is expected, when necessary, to provide services for transfer of image captured on the machine. The Contractor shall supply the hardware (e.g. cassette readers, multi-stack cassette readers, digitizers or scanners) and corresponding software for the capture of images from modalities not producing DICOM images specified in APPENDIX 18. Irrespective of whether Business Model A or Business Model B is offered, this equipment shall belong to HS. The Contractor shall also supply or provide gateways for the conversion and transfer of images if found necessary. The Contractor shall be responsible for installation of Interfaces including arranging and paying for work required to be performed by corresponding parties. Interfaces should conform to current versions of the Dicom and HL7 standards. The Contractor should provide assurance of compliance with these standards. The interface conformance shall be described for the RIS-PACS proposals. All Radiology images of all modalities (X-ray, Ultrasound, Echocardiograms, MRI and Radionuclide scans) from all locations in HS shall be acquired, stored, distributed and made available to all potential users. Policies and procedures applied to acquisition of images in the Radiology Department shall be applied to the acquisition of images from modalities / resources outside of the Radiology Department (as listed in APPENDIX 19). The identification data and other examination information are transferred to the resource (machine) computer system. When a cassette reader is used the same information must appear on the cassette and the cassette reader. If the cassettes cannot be marked with the identifiers, the cassette’s serial number may be used by as an intermediary. Whatever system is used, it should ensure the matching of the correct image with the correct patient. The system may have the functionality for labels to be printed on demand with user-defined examination tracking information. These would be used for the individual images similar to actinic marking of the films. There shall be automatic warnings of previous contrast reactions and known allergies when scheduling or rescheduling. He/she shall be able to indicate that the task has been performed and the performance status in the work list indicated as ‘performed’. The identification data and other examination information shall be transferred to the modalities computer system. All of the raw image captured can be transferred to the PACS database or the operator (technician or radiologist) may select only pertinent images. can be selected, store, and display the full, original raw image data set transmitted from each of the imaging equipment. It is good practice to have a Quality Control procedure before images are permanently stored. For this purpose the manipulated image can be compared to the raw image by the quality controller. The system shall restrict schedules being made on deceased patients to post-mortem examinations only. The system shall be able to record the confirmation of an appointment. It shall be possible to reschedule an existing appointment for an examination or a group of examinations easily. It shall be possible to put an examination on hold if an appointment is cancelled but will need to be scheduled again. These examinations shall be easily accessible to be able to schedule them if and when required. When ordering an Order in the the Radiology department, the patient location shall be the Clinical department where the patient is located. The Radiology department is considered only as a temporary location. Although modalities in Hospital Selayang like CT Scan, MRI and Ultrasound may have manufacturer supplied facilities for temporary storage and manipulation of images, the PACS shall have capabilities to store and manipulate the data before final storage. Depending on the architecture being proposed by the Contractor, this may require the Contractor to supply or provide of one or more server(s) and Storage hardware capable of storing, brokering and serving images in DICOM format. The System shall support the ability to separate images into series that correspond to accession numbers supplied by the RIS. The Contractor shall state the manufacturer and software version of the database used in the PACS. The system shall provide a unified view of and access to all images and related data available in Hospital Selayang irrespective whether the database is central or distributed; allowing for retrieval of any examination known to the system regardless of its physical location. The Database Management System shall ensure that all data and images sent to the archive are captured and stored. The radiographer or any privileged personnel sending images shall be alerted of any failure of the database to capture images and provide suitable advice or instruction. The database shall have the ability to sort examination data chronologically, by patient name, patient medical record number, unique examination identifier, modality, not previously viewed status, dictation status, and a reasonable combination of the previously mentioned sorting criteria. The database shall enable retrieval and presentation of ‘Reported Images’ and ‘Unreported Images’ as separate categories. Security controls including control of access by username, password and privilege categories. The system shall display work flow status and allow task performance to be acknowledged by bar-code reader. 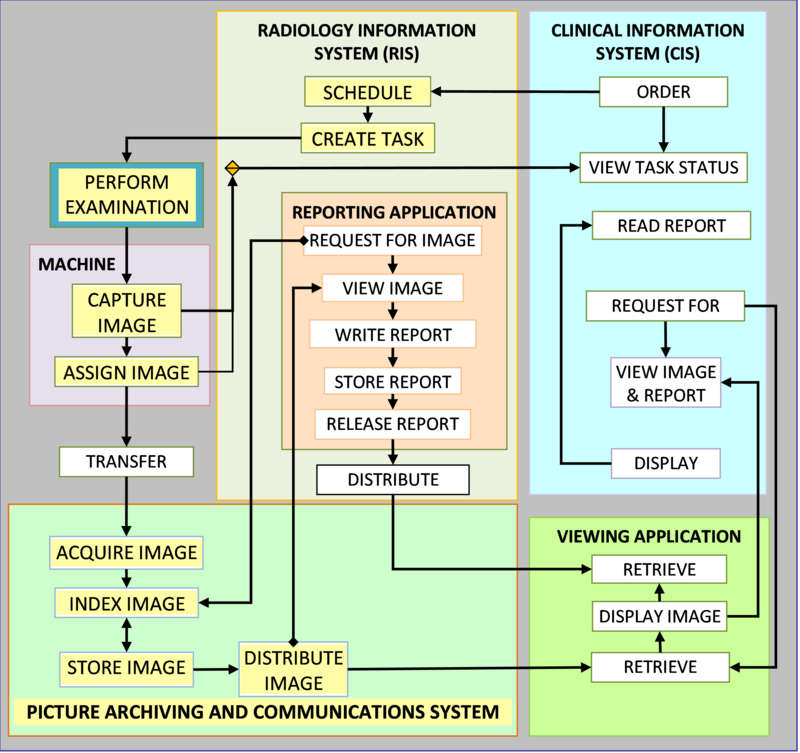 Image-viewing software and equipment for purposes of interpretation, diagnosis and reporting are provided at Radiology Reporting stations. If clinicians are required to report on images taken by them or otherwise (e.g. plain CXR in ICUs, ERCPs, RPGs etc.) then the same software and high definition monitor need to be provided at the clinical workstations at specified clinical locations. Image viewing software for clinicians is made available at clinical client workstations (Desktop and Mobile Personal Computers) throughout the hospital. The images (that have been reported by a radiologist) need not be displayed in very high resolution. The Contractor shall study the current network supporting RIS-PACS, list any known connectivity and interoperability issues that currently exist with the interfaces for the equipment and propose any changes or re-installation of additional or new network components as required. The proposed additional or new network components shall enable the integration of all imaging equipment (radiological and non-radiological) with RIS-PACS, irrespective of location and modalities, and the retrieval of images from all clinical locations at Hospital Selayang. The proposed system shall support all varieties of VLANs that had been installed or configured in Hospital Selayang or any future VLANs. The Contractor shall provide minimum specification of network requirement and network diagram for the proposed system. All the devices that are part of the proposed configuration shall support TCP/IP protocol. The system network shall be in compliance with the Disaster Recovery policies and procedures of Hospital Selayang so that no failure can cause disruption to radiology services. The system shall allow downloading, assigning to the right patient folder and archiving of Radiological images in DICOM format supplied by patients or referring clinicians on or any other portable storage devices such as DVD-ROM, Flash drives or portable hard discs. The RIS-PACS shall acquire these images and store them in the patient’s folder as per the output of other modalities. The Contractor shall ensure that there is one computer, with the necessary accessories to perform image acquisition of radiological images supplied in portable storage media, at each of these locations i.e. the Main Radiology Unit, the Emergency Department radiology Unit and the Outpatient Radiology Unit (Level 4). In Hospital Selayang, hard-copy films from other referring institutions are digitized and stored in the patient’s folder within the RIS-PACS System. The RIS-PACS shall acquire images from Film digitisers in DICOM Format and store them in the patient’s folder as per the output of other modalities. The Contractor shall supply one and locate one (1) film digitizer each in the main Radiology Unit, the Emergency Department radiology Unit and the Outpatient Radiology Unit (Level 4). The specifications, quantity and locations of Film Digitizer is given in APPENDIX 17. The System shall provide for the acquisition, storage and retrieval system all clinical images used in Hospital Selayang in a unified manner irrespective of the number of servers or storage equipment used and regardless of their physical distribution. Provision of better or alternative solution is also open for proposal. The Contractor shall state the number of read and write drives delivered in the standard configuration and that are available as an option in the long-term storage. The Contractor shall state the media options for the long-term level. Include the storage capacity, read/write options, and maximum number of tapes supported by the long-term level storage device. The Contractor shall include with this proposal the results of studies demonstrating the stability and longevity of data integrity of the archival storage media being proposed. The PACS storage system shall the means of monitoring available storage space and alert the system administrator when the storage capacity reaches a critical level. Although many modalities in Hospital have manufacturer supplied facilities for temporary storage and manipulation of images, the PACS shall have capabilities to acquire, store and manipulate the data before final storage. Depending on the architecture being proposed by the Contractor, this may require the Contractor to supply of one or more server(s) and storage hardware capable of storing, brokering and serving images in DICOM format. All examinations and images shall be automatically transmitted to the permanent storage system upon validation by Radiographers or Radiologists. Raw images shall be retained in temporary storage for a period of one (1) month. No images or examinations shall be deleted from temporary storage until the images or examinations are stored in permanent storage. Film rejects analysis fields shall appear only for relevant examinations. Fields to record details of any contrast used appear only for relevant examinations. Contrast reactions can be entered only for examinations using contrast agents. Technique values to appear for all relevant examinations. Medical Radiation Technologist (MRT) initials – 3 separate fields available. Field for recording additional radiologist/registrars involved in a examination only appears for relevant examinations. Free text field for comments about the performance of the examination. The system should allow defaults or automatic recording of information in some fields for each examination defined. If more than one examination has been performed at the same time and location then it should be possible for these examinations to be selected together to be able to enter data more quickly. For example, if multiple examinations are selected together, data input for the first examination shall provide the defaults for the subsequent examinations. Information (volume/charge) shall be sent to the Patient Billing System when the examination has been performed. The system shall be able to interface with it. It shall be possible to record specific supplies used for an examination. To make this process quick the use of defaults and then modifying any details if necessary would be desirable. The permanent storage device shall be compliant to storage area network (SAN) standards. The Contractor shall provide or supply a storage system with fast response time (from request to display), with adequate storage capacity for the needs of HS, from a reliable the manufacturer, conforming to environmental requirements. The server and storage device of PACS shall have the capacity of storing all images for the next five (5) years. The design shall have the capability of incremental modular addition of storage space. The Contractor shall provide calculations for the storage capacity required to meet the specifications based on Examination Volumes, provided in APPENDIX 22. The Contractor is responsible for updating (to current universally accepted standards) the format of the image during the contract period. At the end of the contract period, the Contractor shall handover documentation regarding the latest image format, data structure and data model to allow Hospital Selayang to migrate the data to a new PACS system if necessary. The PACS DBMS shall allow for database managers to purge and transfer out images of inactive patients from the Operations Database to off line (on the shelf) data-image storage devices. The selection, purge and transfer of images from identified patients shall be automated, as far as possible, based on rules. The archive shall be modularly designed for easy expansion due to increased examination volume without having to replace the original. The database shall use storage media based on the latest technology with low risk of obsolescence. The PACS data server-data storage system shall be equipped with mechanisms to ensure data integrity and high data availability through redundancy, mirroring using Redundant Array of Inexpensive Discs (RAID) technology or any other methods. The Contractor shall propose a duplicate data server-data storage system that is ready to take over from the system in use for current operations if and when it fails. This duplicate system shall be located at a separate location in HS. The PACS system shall have the ability to copy data and images onto suitable portable data storage media for use as back-up during recovery if and when a disaster occurs. The data backup procedure shall be incremental or complete and shall be in compliance with Storage Area Network (SAN) technology. The back up procedure shall be performed without affecting operations of the PACS System or business operations. The RIS-PACS shall be able to provide and restrict access according to user or user category based on privileges laid out by HS. The list of privileges for users shall include the ability to perform various functions of RIS-PACS as elaborated in this documented. This shall include at least view only, perform tasks, make corrections, move or purge images. The RIS-PACS shall have options for individual users to configure views, work lists, patient lists and image lists according to their preferences, and for these preferences to be defaulted for the particular user. The Contractor shall state any license fees associated with the access for viewing of images. In general the use of username and password shall be sufficient for assigning access privileges. The Contractor is at liberty to propose other additional means. Single log- in into all RIS-PACS applications shall be available for designated categories of users. 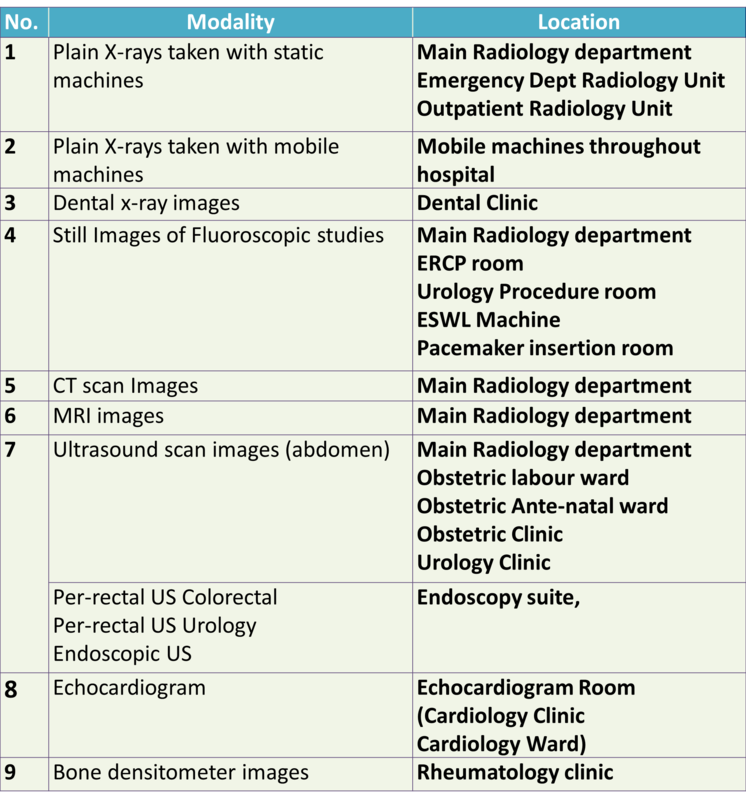 Radiologists (or other persons so privileged) shall be provided with personal work list of examinations and corresponding images to select, retrieve, view (patients) and report. Patients scheduled for examination on the day (for purposes of review of previous examinations). Patients registered for admission to the ward. Patients scheduled for procedures requiring review of previous images e.g. surgical operations and other invasive procedures. Because clinical scheduling is performed within the CIS, creating the pre-fetch lists in RIS-PACS require the transfer of scheduling data from the CIS to RIS-PACS. Raw image data shall be made available to radiologists at their reporting stations when required. The pre-fetching of images and routing them to various locations is a method of facilitating rapid retrieval of stored images from previous examinations. It assumes that direct retrieval from the central archive is slower than from an intermediate local storage server if it is provided. The Contractor may choose to provide alternative solutions of ensuring rapid retrieval other than that described below. The System shall display the pre-fetched images for the particular event / location as a list of patients with attached identification data. If there is more than one previous examination, they shall be sub-grouped into modalities and examinations in each modality arranged in chronological order. In HS, most interpretation and reporting of images would be done by Radiologists in the Radiology department. However, senior clinicians are also privileged to interpret, diagnose and make decisions on the images taken. The Contractor shall supply or provide software and hardware for different types of stations catering to different functions i.e. Diagnostic Review Station (DRS) for Radiologists to view and report on images. The Diagnostic Review Station (DRS) shall be placed in the Radiology Department. All viewing stations shall be installed with a standard viewing application, configured to serve the function at that station. The Diagnostic Review Station (DRS) shall include a CPU, a standard computer monitor and two (2) image viewing monitor with sufficient luminance and resolution to allow primary. diagnosis by the radiologists. The standards and specifications for the viewing stations, the quantity and locations of various types of Viewing and Worksttaions are given in APPENDIX 18. Images of similar structure with Different modalities taken at same session or at different sessions. The display stations shall have the ability to save 10 preset window/level settings. Preset window/level settings shall be user, modality, and organ system specific. The DRS shall have ability for the user to configure preset window/settings. The RIS-PACS shall enable clinicians to use the functionalities to manipulate images, before interpretation, diagnosis and decision, making similar to those provided to radiologists. The RIS-PACS system shall enable clinicians to record their interpretations, conclusions and diagnosis in data fields shared with radiologists or separate data fields in RIS-PACS. These data shall be made available in CIS similar to reports made by radiologists. The RIS-PACS system shall enable clinicians to search the archive for images by unique identifiers or sub-sets e.g. locations (wards, clinics etc. ), departments or care providers. The RIS-PACS system shall enable clinicians to select images for viewing from standard lists (e.g. drop down menus) categorized by clinical location of patient, department, name of ordering clinician and other possible parameters. It is Hospital Selayang’s preference that Remote Viewing Stations (RVS) will be supported by World Wide Web technology. If the Contractor does not support this type of solution, the Contractor may provide an alternative solution. Specific details of the alternative solution will be appreciated. The System shall be configured to enable users stationed outside of the local area network (LAN) of HS to access the RIS-PACS system using similar viewing application used in HS. The maximum concurrent users accessing from remote locations shall be restricted to six (6). Each remote viewing station shall have specifications and standards equivalent to Clinical Diagnostic-Review Stations. Each remote viewing station shall have the characteristics of viewing stations within HS. System availability and security shall be managed as per other viewing stations. The Contractor shall ensure that the integrity of data and images are maintained as they are transmitted to the remote location. The System shall enable radiologists and clinicians to insert sets of images with proper identifiers and indices as e-mail attachments. The e-mail facilities, policies and procedures already in use in HS shall be used for the transfer of the images to the recipient. For the current project there is no provision for the implementation full Tele consultation services (real-time or store-and-forward). It would be an advantage if the system proposed has the capability to support Tele consultation services. HS functions in a filmless environment. However, printed X-ray films would be provided to care providers outside of the hospital for purposes of referral or continuity of care. The RIS-PACS System shall create print jobs as a work list on RIS based on orders made from the CIS Order Management System and alternatively the RIS Ordering application. The RIS-PACS System shall enable the requested image(s) to be loaded to printers and printing performed automatically when print jobs are initiated by privileged personnel of the Radiology Department. The Contractor shall supply or provide three (3) film printers to be located in Emergency Department, Radiology Unit and Outpatient Radiology Unit (Level 4). The RIS-PACS System shall create tasks in RIS to export data and images onto portable storage devices based on a based on orders made from the CIS Order Management System and alternatively the RIS Ordering application. The images captured on the storage media shall be attached with unique identifiers, examination data and properly indexed. Simple viewing application software shall be included with every device used. Clinical Reporting here refers to the documentation of findings and conclusions reached as a result of analysis and interpretation of images, aided by clinical and other data, by Radiologists or any clinician performing a similar function. There shall be a facility to create and assign automatically, a work list of examinations for reporting to named Radiologists. There shall be a facility to create and assign automatically, a work list for the editing of dictated text to named Typists. The system shall provide the facility to assign the task of editing and authorization of reports made by junior Radiologists to a designated Senior Radiologist(s). A co-signing function shall be included. The system shall provide the facility to assign the task for a Radiologist to provide consultation to another Radiologist. The Radiologist being consulted shall be allowed to express his advice, opinion or findings as an addendum. A co-signing function shall be included. The work list of the particular personnel shall be displayed automatically on access of the system based on username on log-in. Tasks in the work list shall be sorted in chronological order, by patient name, examination type / modality and reporting status (dictated, edited, reviewed and authorized / completed). There shall be a facility to reassign an item in the work list to another personnel based on rules and privileges. For each of the lists the system shall indicate the waiting time for the reporting tasks; highlighting cases where the elapsed time exceeds the performance standard. A major function of RIS-PACS is the facility for Radiologists to report on images within either RIS or PACS. Once documented and validated the report is stored in a database in either RIS or PACS. It is displayed in RIS, PACS and within the patient’s Medical Record (CIS). RIS-PACS may be complimented by a system equipped with software and hardware that support the use of voice recognition. The system can record oral dictation, transform and transcribe it to text automatically. The transcribed text shall are made available as a draft to the Radiologist or a typist for edition, amendment or correction using a word processing application with a spellchecker supplied by Contractor or already available in HS. The audio-recording shall also be available to the typist. Draft reports edited by typists shall be made available again to Radiologists assigned to perform further editing and authorization. The application shall also allow for the text of the report to be typed directly on a document template. Pre-prepared but amendable model reports or standard phrases shall be provided for normal and commonly encountered findings. The system shall provide the ability to to access reports of previous examinations via a link within the current report template. It shall be easy to copy and paste part of a report of one examination to the report of another examination performed on the same patient. The system shall ensure that transcribed results conform to a predefined format and content by checking against validation rules based on requirements. Reports shall be designated as drafts until they are authorized. The system identifies persons allowed to authorize reports based on examination categories or order type. The system allows editing of drafts and unauthorized reports by persons assigned to perform the task. The unedited and uncorrected reports are retained and made available on request for comparison with the authorized report for educational and medico-legal purposes. The System shall allow for consultation between Radiologists. The Radiologist being consulted shall be allowed to express his findings, opinion or advice as an addendum to the draft report. As a rule, only authorized reports are made available to clinicians and included the Electronic Medical Record (EMR-CIS). Only in well defined circumstances should the draft report be made available to clinicians. The system should not allow any user to alter an authorized report. Corrections are made as an addendum and clearly indicated as such. The addendum shall be added to the report appearing in the RIS, PACS and Electronic Medical Record (CIS). It should be possible to retrieve, view and print past results easily and quickly. The patient and current order information should be accessible from within the same function. As a function within Clinical Information System (CIS-EMR). Clinical Diagnostic-Review Stations (CDRS) have functions and specifications similar to that of radiologists with functionalities restricted by access privileges. They are made available at selected locations in Clinical Units where there is a need and privilege for clinicians to make diagnostic interpretation of images themselves on their own for example in emergency situations or complementary to the interpretation made by radiologists. As a rule, Orthopaedic surgeons and cardiologists rely on their own interpretation of most images. Even Chest X-rays in Intensive Care Units need to read on the CDRS. The Diagnostic-Review Stations need to have the same specifications as those provided to radiologists to allow the clinicians to make primary radiological diagnosis. Therefore, it should be equipped with. the same image viewing application, a CPU with sufficient memory, a monitor with sufficient luminance and resolution. [Example Grayscale with 3 Megapixel (2048 x 1536) resolution , 20 inch diagonal diameter, LED display]. Preferably the clinician is able to view images and reports together from within the Clinical Information System (CIS-EMR) at Clinical Workstations ((Personal Desktop computers or Portable Computers) . They need to have an image viewing applications and a monitor of with a resolution of at least one (1) megapixel. The images are of lower resolution and clinicians need to be aware of this.